Why All the Google Hate? Standout earnings… so why’s Wall Street waffling? Looming global aluminum crisis, now averted? Hmmm… As we write this morning, shares of Google parent Alphabet are down nearly 5%… because Wall Street “professionals” can’t make up their minds about what they want. GOOG delivered its quarterly numbers yesterday after the close. The headline figures were great. Profits jumped 73% from the same quarter a year ago. Advertising revenue grew 24% — the fastest growth since 2011, when the company was half its current size. Never mind that GOOG is still sitting on a staggering sum of cash — $102 billion. Never mind that Amazon, by contrast, takes nearly every penny of profit and immediately plows it into new ventures, and Wall Street applauds. But Alphabet gives the slightest nod toward Amazon’s business model and traders can’t wait to hit the “sell” button this morning. Crazytown. We bring up the subject this morning because we’re on the verge of launching a one-of-a-kind service. It aims to profit not from earnings season, but rather the reaction to earnings season. The rest of the stock market, you wonder? Going nowhere fast. The Dow and the S&P 500 are nearly pancake-flat at last check. The Nasdaq is down half a percent, Alphabet helping drag down the tech sector as a whole. But the big news is in the bond market. The yield on a 10-year Treasury crested 3% this morning — a level last seen in early 2014. It was the approach toward 3% that the mainstream told us tanked the stock market last Friday. (“OMG, borrowing costs for companies will rise!”) But now that we’re there, the major U.S. stock indexes aren’t moving much at all. (“Meh, the economy is strong enough to handle higher rates.”) Ain’t market psychology something? The big economic numbers of the day both have to do with housing. New home sales leaped 4% last month — way more than expected. Perhaps homebuilders are starting to catch up with demand. Meanwhile, the Case-Shiller home price index jumped 0.8% for February — also way more than expected. Year-over-year growth works out to 6.3%. Donald Trump blew his chance to remake the Federal Reserve, in the estimation of Jim Rickards. That’s the year the Fed was created, as it happens. Instead, “Trump played it safe,” Jim says. The president promoted existing board member Jay Powell to chairman. In addition, “Trump nominated Randy Quarles, Marvin Goodfriend, Richard Clarida and Michelle Bowman to fill four of the five vacancies. 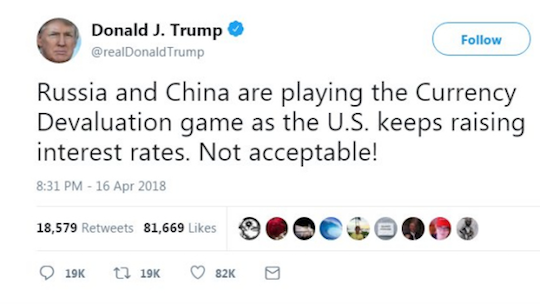 As we said at the time, the Chinese currency has been rising for nearly a year now… and the ruble has tanked in recent days only because of U.S. sanctions. It’s Jim’s opinion that Trump’s real target in that tweet is the Fed. “When Trump says, ‘…the U.S. keeps raising interest rates’ that’s obviously a slap at the Fed. This tweet should be seen for what it is: an attack on Fed independence and a plea for a slower pace of rate increases and a weaker U.S. dollar. “The Fed is on track to hike rates in June, but they may be overdoing it and growth may slow significantly by the late summer. In that case, the Fed may take another ‘pause’ in rate hikes in September. If that happens, the dollar will weaken and gold prices will soar. In the meantime, however, the dollar remains as strong as it’s been anytime in the last three months — with the dollar index holding steady just below the 91 level. That dollar strength translates to gold weakness. The Midas metal still languishes near $1,327. A crisis in global aluminum supply might be over, mere days after it began. Those aforementioned U.S. sanctions against Russia? One of the biggest targets was Rusal, the world’s second-biggest aluminum producer. 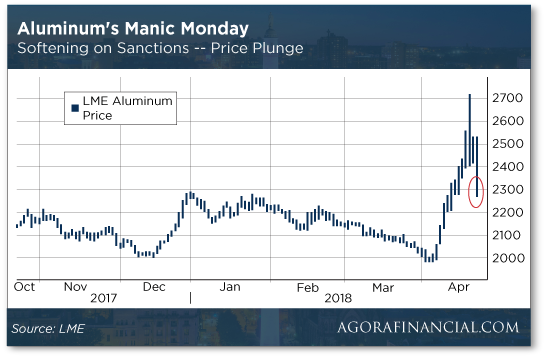 “The sanctions,” according to The Street, “essentially boxed Rusal out of the $140 billion global aluminum industry by making it impossible for the company to do business in U.S. dollars, which are the de facto currency in most commodities markets.” Aluminum prices leaped to their highest levels since 2011. “U.S. sanctions have brought one of Russia’s industrial titans to its knees,” is Bloomberg’s spin on what changed since the sanctions were announced April 6. 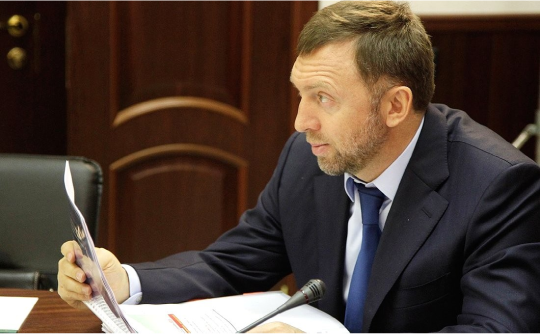 Billionaire Oleg Deripaska owns 48% of the aluminum producer Rusal. Deripaska built his empire under Boris Yeltsin, not Vladimir Putin. His policy under Putin has been to keep his head down and maintain amicable — but not overly involved — relations with the Kremlin. “He was never a Putin crony, a participant in his hockey games, a judo sparring partner, a fellow KGB veteran,” says Bloomberg. But both the Journal and The New York Times anticipate a boomerang effect. The new rules might well “serve to strengthen Facebook’s and Google’s hegemony and extend their lead on the internet,” says the Times. Say it ain’t so! Regulations work to the advantage of entrenched incumbents, while throttling upstart competitors? Who’da thunk it? As for health savings accounts… yes, they’re a good thing in that they’re “triple tax-free” — that is, your contributions aren’t taxed, the interest and capital gains aren’t taxed and your withdrawals aren’t taxed as long as you spend them on “qualified” health care expenses. But the feds can and have changed what constitutes a “qualified” expense. Remember when you could use HSA money to buy over-the-counter meds? That went away with Obamacare, and it didn’t change with the Trump/GOP tax law. You know what? I’ve tried that for a somewhat pricey diagnostic test I get every two or three years. But there’s so little “price transparency” within the health care cartel that it’s not remotely worth the effort. It really is like the blogger Karl Denninger’s analogy: You pull up to a gas station, and learn what the price is only after you’re done pumping… and that price could vary wildly depending on who provides your auto insurance.